SAND&KLEEN, a patented design, combines the features of a standard drywall sanding head with the power of your shop vacuum to remove dust as you sand. The exclusive Aquair Water Filter traps dust safely before it reaches the vacuum system. 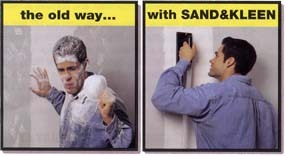 SAND&KLEEN vacuums away joint compound dust during the sanding process and eliminates airborne dust completely. Users don't need goggles, masks or respirators. SAND&KLEEN is available in a hand sander system, pole sander system, or as a combo kit with both hand and pole sander heads. Models contain the complete system including the Aquair Water Filter - all you add is a regular shop vacuum.